Could you tell us a little bit about yourself and your background? I’m a 27-year-old Italian who has always had a passion for English; I started studying it on my own when I was 6 and I found out that an English course for children called “Magic English” existed and I begged my parents to buy it. Why did you decide to take the CELTA course? I was going through a tough time last year and I had to decide whether to stay at a job that I didn’t really like or to try and find something else. An acquaintance suggested that I should look for something where I could use English, so I did some googling and found out about CELTA. I had never actually thought that I could be a teacher, but I also didn’t really know that EFL and ESL were an option; after reading about how the course was structured I thought it could be a good fit for me and I decided to do it. You mentioned that you did the Cambridge Proficiency test before taking the CELTA. Would you recommend it to other non-native speakers? I actually did it a couple of years before CELTA and for unrelated reasons, but I think that it’s quite important to have it if you’re not a native speaker. If I remember correctly, to do CELTA where I did it you either have to have a certificate or you have to take a test, so having CPE was very useful and it helped me save time; it can also make it easier for students (who, lest we forget, are also customers) to trust that you actually know what you are talking about and for employers as well. From your CELTA course experience, what the most difficult part for you? Building enough self confidence to actually teach was the most difficult part; I had never taught before and I am quite an anxious person, so the first couple of weeks of having to stand in front of 20 people who were trying to learn something from me were very complicated. And CCQs, which I am still not very good at (but I’m working on). And what was the best or most rewarding bit of the course? When I finally felt like I was in control of what was happening during the hour I was teaching. As I mentioned it happened halfway through the course (I did the intensive) and it was a really good feeling, both from a personal and from a professional point of view. I was still a bit overwhelmed by the amount of information that I had been given on what to do in the class, but I had also finally started to figure out how to use it to my own advantage. How have you found it looking for work with a CELTA since completing the course? Quite different and much easier than before, although to be fair before CELTA I had never looked for jobs in the English-teaching world. I do have an ESL job now and I have just got back from an experience in a Summer School in Oxford, and both those things wouldn’t have happened without CELTA. 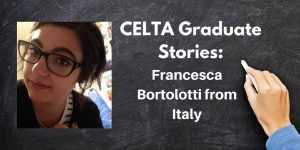 How about your CELTA graduate stories? As so many students like to hear how it was for others, if you have taken the CELTA course and would like to share your experience, let me know by email or on Twitter! I look forward to sharing more positive stories and inspiration with your CELTA graduate stories! How To Manage Timing In A CELTA Course Lesson Plan?